Putting aside the Democrats’ reassessment — or the irony that it’s not the GOP that has to open its tent — and putting aside that we’re no longer a polarized nation . . . and that a realignment of sorts occurred — a more dramatic realignment than most, since it sweeps into power the GOP on every level, the most important one arguably being their clean sweep in the states, as well as the municipalities . . . federalism organized under one party has not been so powerful since the Civil War. Bracketing all that — another way to look at the polarization/realignment/Democrats as donkeys now all braying is — in conversation, or as a binary. 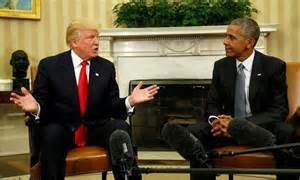 As President Barack Obama’s politics and identity politics — or the universality of his identity-less politics — put him in the position of being betrayed by many American people, or should I say demonized — denigrated — as the Antichrist, as a boy, as an illegitimate president given the Birther controversy — it’s only fitting that Donald J. Trump (DT) was in conversation and was given Obama’s warm seat. DT not only participated in the Birther movement, and led it to some extent; he embodies the exact opposite of our sitting lame-duck president, Barack Hussein Obama. As one friend noted, 9/11 has now been replaced by 11/9 — the day DJT got proclaimed president(-elect). This entry was posted in 2016, American Politics, Mirror Opposite Politics, Neotribal Media Moments, Obama's Lame Duck Years by Professor Ruth O'Brien. Bookmark the permalink.